1. As former editor of interiors bible Elle Decoration UK, what was your highlight of overseeing such an influential magazine? We did some amazing things but what sticks in my mind is the time we styled the windows of Selfridges in association with Swarovski. Deco’s stylist Amanda Koster rose to the challenge and came up with some amazing and creative designs. We worked through the night to do the 10 or so windows, painting the walls, creating a chaise longue of flowers… The most difficult was installing Tom Dixon’s huge Ball chandelier, mainly because the hundreds of threads holding the crystal balls had got into a tangled mess in transit - I will never forget the looks of horror when we removed it from the box! It took many people a lot of hours to untangle it. But all the hard work and stress was worth it – the next morning I sat on the bench outside the store and watched the amazed reaction of people and it felt good to have done something that stopped people in their tracks and made them think about design. 2. You must have picked up many tips during your career! Can you pin point some tips for interior shopping? - It is worth spending the extra cash for an investment piece that will last – I still have a - Terence Woodgate sofa I bought from SCP 13 years ago. - All vintage stores are worth a good rummage! 3. In between all of your high profile positions you also blog for online site Dwell. Do you think that a lot of people use the internet over print for interior inspiration these days? I think the internet has transformed the way we get inspired whether that be for fashion or interiors. It allows people to search for inspiration from all over the world, from not just the professionals but also creative amateurs who often have inspiring (and less expensive) ideas. It has also given smaller designer makers the chance to shine with their own sites and blogs, as well as interiors entrepreneurs who can create amazing boutiques without the costs associated with a physical shop floor. That said, however, magazines are still important for inspiration – visually they can showcase amazing design much better than online, and there is something about the tactile nature of paper that still makes a magazine special. They also give the reader an edited choice which is a real help. 4. Where do look to for your own interior inspiration? Magazines such as ELLE Deco (of course) – as a magazine is a great way to see the latest trends etc clearly edited as well as numerous lifestyle sites such as MyDomaine. Pinterest is useful when I’m looking for something specific. 5. You've clearly travelled far from your Australian home having lived in the UK and France. How has moving around benefited you as a writer and interiors expert? It has made me aware that interior design and architecture is a global industry and that what influences trends and our choices comes from beyond our shores. I’m now also the editor of an interiors magazine in Malta and learning about the Mediterranean way of living which is fascinating. 6. 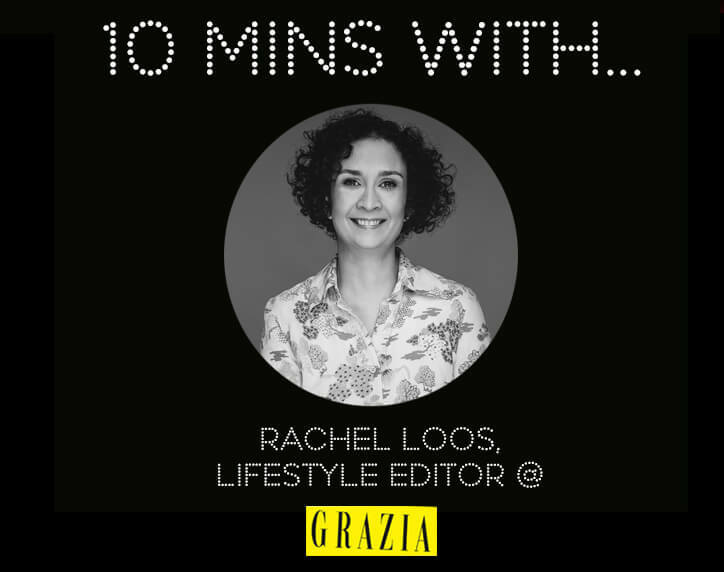 You are currently the lifestyle editor at Grazia, which is a prestigious title to have! When you started out in your career was it a natural progression to move into home and interiors? I actually started out in newspapers in Australia as a general interest writer and continued that career when I came to London. I moved into glossy magazines when I was made the deputy editor of Company; I then became the deputy editor of British ELLE. ELLE and ELLE Decoration have the same publisher and are both at the upper end of the style spectrum so although one is fashion and the other interiors, it was a fairly natural move. I then left to live in France; while there I was asked to join the Grazia team. 7. What prime advice can you give to our readers who are interested in entering the interiors world as a journalist or blogger? I think the world of journalism has changed incredibly since I started – today bloggers give everyone a chance to create a name for themselves in a way that was not possible when I began. Now it is expected that if you want a career in writing, whatever genre, you will have your own blog as it allows you to show off your writing skills and creativity, as well as your commitment to writing. It’s not easy to make your mark, though – there are many bloggers out there. I would advise finding a niche, or an area that is less well-covered, and making it your own. 8. Can you let us in on your favourite trends for 2016? warm metallics, weathered copper, brass or gold, are great for adding that bit of high sheen that brings a room to life. Also texture that comes not just from soft and fluffy but also materials such as concrete, wood, metal. 9. What are your must have items for the perfect home? - A mid-century modern sideboard – starting to be a bit of a design cliché but I still love mine! 10. What's your favourite new RSG item and why? If money was no object I would: go travelling for a year. I spent three months in South America on my way to England from Australia and being able to travel for that long felt like a real luxury. My best skill is: writing. My favourite film is: All the President’s Men – and I’m looking forward to seeing Spotlight. Both show the value of properly trained journalists. In 5 years I’d like to: still be writing. Take a look at Rachel's fabulous portfolio and keep up to date with HOMEWORKS - a fab interiors blog that Rachel edits!